NZCrusader: How many meters from the cabinet are you? Physically, roughly 550 metres but not sure how the cabling is getting to my address. Might just go through multiple houses instead of zig zagging to me like the road does. 17a comes in at around less than 200M, so your probably out of range unfortunately..
Have also heard that 17a can come to lines with less than 8db. In any case, I'm happy with my speed and it's already exceeded my expectations. Onward and upward from here. 8db was an assumption without considering the fact that 17a attenuates faster than 8b. I was getting 8.5 dB d/s attenuation on my ADSL router. My VB104W is showing 2.0 dB. Roadside cabinet is about 80m away as the crow flies. When first connected, my d/l speed was quite consistent at about 30 Mb/s. 5 days later it's quite consistent at about 37.5 Mb/s - it jumped up a bit a couple of days ago and stayed there. 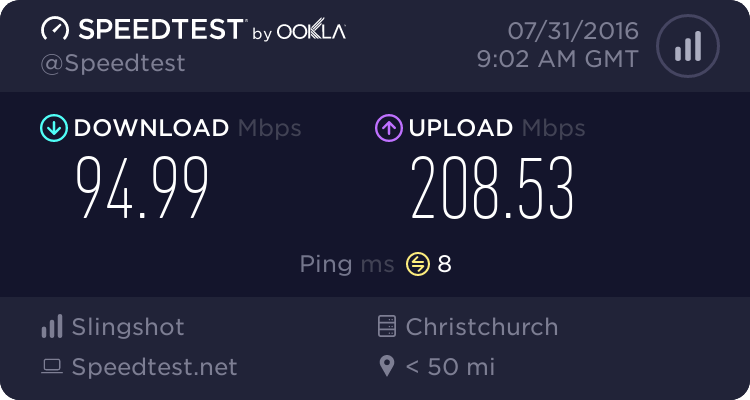 One thing I notice is that via wireless, I get 9.75 Mb/s upload, but via cable that drops to about 8.4 - this just doesn't make sense to me - but perhaps there is a reason. Fred99: I was getting 8.5 dB d/s attenuation on my ADSL router. My VB104W is showing 2.0 dB. Roadside cabinet is about 80m away as the crow flies. That is quite poor for 200m. NZCrusader: That is quite poor for 200m. Maybe I am not as near as I thought, or maybe I am getting some issues! Weirdly, through WiFi I lose downstream rate, but my upstream increases slightly to 9.5Mb/s! The stats on the router reckon I am syncing at 35 down and 10 up FWIW. I do have 304 CRC errors - not sure what the acceptable threshold on these is though. change to a different wifi channel might fix it. Yup - same here. To me that's a very weird phenomenon - but I have insufficient geek ability to surmise whether that it's actually true weirdness - or that there might be a rational explanation. paulqnz: I have also been having issues with the VB104W, slingshot have no idea. Port forwarding doesn't work for my teamspeak server anymore. And the router likes to lock up at random times, can't ping it, can't login to it, forces me to power boot it which I'm not happy about doing been that it affects DLM. Slingshot has said they will send me a new router. only thing ive noticed on mine is sometimes it will just take ages to load the routers web interface like 30 seconds to load one page. So my new router that slingshot sent me, still has the same issues, maybe worse, I have had to reset it twice today. paulqnz: So my new router that slingshot sent me, still has the same issues, maybe worse, I have had to reset it twice today. I used to have to restart mine but fix it by disabling LOG. Got to Management -> Log Configuration and untick Enable Log and click Apply. Have been running sweet now for days!